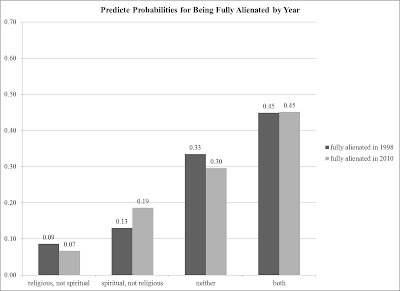 UPDATE (3/19/2013): The "Predicted Probabilities for Being Fully Integrated by Year" figure below is wrong. I have corrected it here. This invalidates the analysis below as well. Happy 500th post to Soc'ing Out Loud! Yeah, it's arbitrary, but whatever. In the three previous posts, I laid out the data, methods, preliminary results, and began analysis of the independent variables of primary interest. Here is a bit more on those IV's of primary interest. What is particularly striking is how the effects of being fully integrated have changed over time. Being fully integrated in 2010 meant than one was considerably more likely to identify as both religious and spiritual and less likely to identify as neither religious nor spiritual than in 1998. 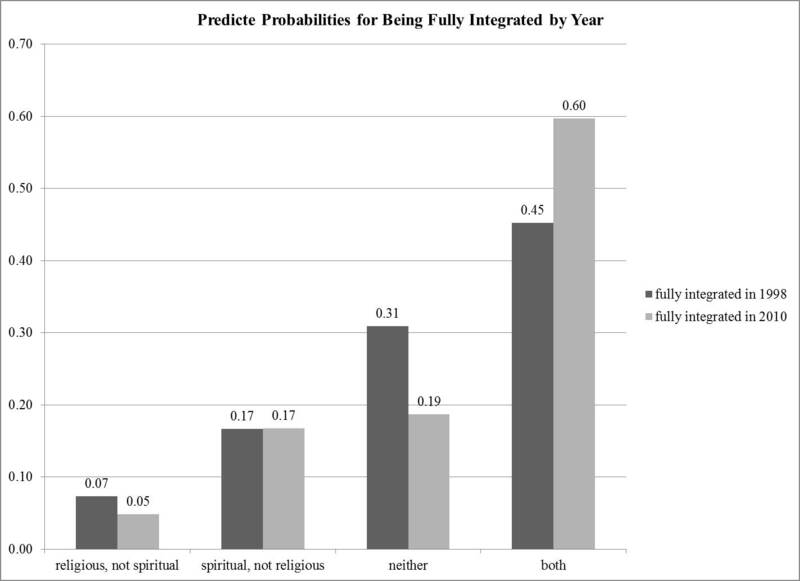 Over time, integration has been increasingly differentiating the neither's from the the both's.